After reading Rivertime, I felt like hopping in a canoe and paddling down the nearest river for a few days. This picture book will take you on a joyful and meandering journey on the Glenelg River in Victoria. 10-year-old Clancy takes a 10 day canoe trip with his Uncle Egg. Although Clancy misses his screens and technology at first, he gradually begins to appreciate the challenges, beauty and peace that fill each day. He spends his time perfecting his paddling, spotting wildlife, learning camping skills and, when his arms get tired, making a sail for the canoe. Clancy swims with the local kids during the day and, in the evening, their families join him and Uncle Egg to share music, stories and a campfire. As the time slips past, Clancy merges into the rhythm of the river and develops a bond with nature that will follow him home. 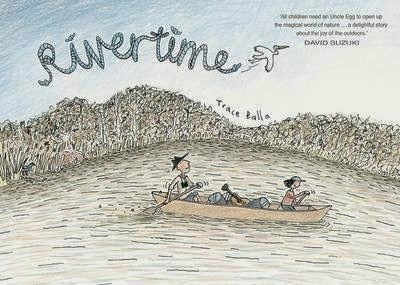 The layout and format of Rivertime invites the reader to slow down and look around as each page contains Clancy’s first person narrative as well as speech bubbles to offer a closer look at the characters’ personalities. Trace Balla’s illustrations also give this book a gentleness that bolder colours and stronger lines would not have captured. The detail she includes encourages the reader to slow down and look around as the reader will want to see everything. Children from 8-12 will enjoy Rivertime but I wouldn’t limit its ability to reach any age. This is a story that celebrates nature, people and the importance of protecting our natural environment. The parallels between the visual aspects of this book and its story work well to offer a rich experience. Trace Balla is a woman with many talents and interests. As well as writing and illustrating picture books, she is an art therapist, animator and works in computer illustration. She also facilitates art workshops that incorporate a variety of techniques, many of which use natural or recycled materials. For more information about Trace Balla, please visit http://traceballa.yolasite.com/.